Obesity increases inflammation which in turn increases muscle loss. And muscle loss can increase obesity. As the article below states, they potentiate each other. When muscle loss is not apparent, there is greater risk for falls and other injuries. You go to use a muscle and are surprised when it isn’t there. Recently, the new concept of sarcopenic obesity has emerged, reflecting a combination of sarcopenia and obesity. The rapidly increasing prevalence and serious consequences of sarcopenic obesity are recognized as a critical public health risk in the aging society. 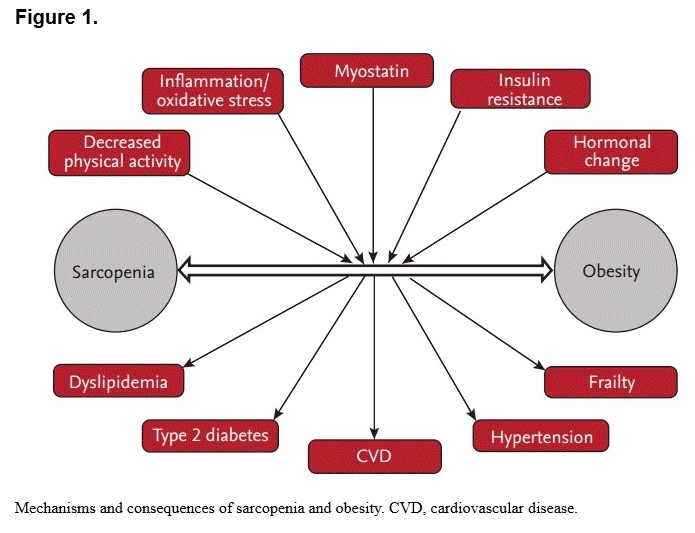 Sarcopenia and obesity share several pathophysiological mechanisms, and they may potentiate each other. It’s not only older people who are affected. Muscle loss can begin by age 30. Insulin resistance plays an important role in muscle fiber atrophy and mitochondrial dysfunction. … In the KSOS study, type 2 diabetes was independently associated with an increased risk of sarcopenia. Hormonal changes, e.g. reduced androgen and estrogen concentrations decrease muscle mass and strength. Previous studies have suggested that sarcopenia is an inflammatory state that is driven by proinflammatory cytokines and oxidative stress. 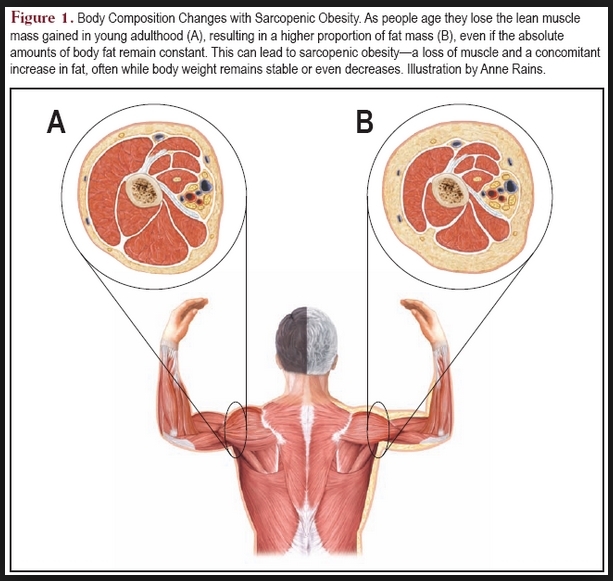 In the diagram below, the red boxes on the top represent inputs or “causes” if you will of sarcopenic obesity. The boxes at the bottom represent outputs, conditions or diseases to which sarcopenic obesity contributes. A vicious cycle may exist between the accumulation of ectopic fat and the loss of skeletal muscle mass since they have a reciprocal influence on each other. Exercising (although exercise alone will not stop muscle loss). Getting enough protein but, just as important, not getting too much, especially too much sulfur-containing animal protein. Eat beans. Reducing fat intake since dietary fat, especially saturated fat found primarily in animal foods, has been shown to increase insulin resistance. Consuming enough calories and enough nutrients (this becomes more difficult with age). Maintaining a state of low-level metabolic alkalosis (by eating lots of potassium-containing fruits and vegetables and by not eating much animal food). This entry was posted in Uncategorized on April 1, 2018 by Bix. These posts on sarcopenia are very timely and interesting to me. Am at an age (old) where it’s obvious this occurs and not being helped by the fact in Feb I dislocated and fractured a shoulder so am unable to exercise and do weights. Will start therapy soon so will improve. Anyway all that you are reporting is great to know and absorb. Thanks! Ow! Glad to hear you can still use it. Your optimism is your best weapon. I admire it.